A vestibular schwannoma is usually a slow-growing tumor (benign) in nature that develops from the nerves responsible for balance in the inner ear. This type of tumor is formed from the over-production of Schwann cells (the cells that normally wrap around the nerve fibres like the skin of an onion that normally wrap around nerve fibres to support and insulate the nerves). 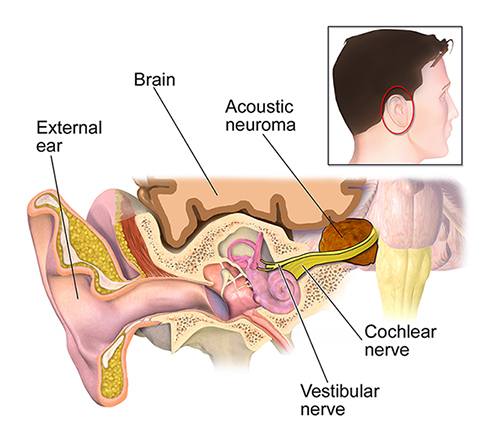 As neuroma grows, it affects the hearing, usually causes unilateral (one-sided) or asymmetric hearing loss. Rarely, it may grow rapidly and become large enough to press against the brain and interfere with vital functions. WHAT ARE THE SYMPTOMS OF NEUROMA / VESTIBULAR SCHWANNOMA? Hearing loss, which is gradual but in some cases, it may be sudden and occurs only one side or more pronounced on one side. WHAT ARE THE CAUSES OF NEUROMA / VESTIBULAR SCHWANNOMA? In most of the cases of neuroma, there is no identifiable cause. Some researchers believe that the cause of vestibular schwannoma appears to be a malfunctioning gene on chromosome no. 22. In normal cases, this gene produces a tumor suppressor protein that helps to control the growth of Schwann cells covering the nerves. WHAT ARE THE COMPLICATIONS OF NEUROMA / VESTIBULAR SCHWANNOMA? Large tumors may press on the brain stem thus preventing the normal flow of fluid between the brain and spinal cord (cerebrospinal fluid). In such case, fluid can build up in the head increasing the pressure on the skull. Vestibular schwannoma is often difficult to diagnose in the early stages because signs and symptoms may be subtle and develop gradually over time and the common symptoms such as hearing loss are also associated with many other inner and middle ear problems. Audiometry (Hearing test): In this test, the hear sounds are directed to one ear at a time. The audiologist presents a range of sounds of various tones and ask the patient to indicate each time when the patient hears the sound. Each tone is repeated at faint levels to find out when the patient can barely hear. Magnetic Resonance Imaging (MRI): It is the preferred imaging test to confirm the presence of neuroma because it can detect tumors as small as 1 to 2 millimetres in diameter. Modern treatment may vary depending on the size and growth of the neuroma. It includes monitoring, surgery or radiation therapy causing severe side effects. Planet Ayurveda offers an effective treatment for the patients of neuroma/vestibular schwannoma. Planet Ayurveda offers Crab Care Pack for the treatment of neuroma/vestibular schwannoma. 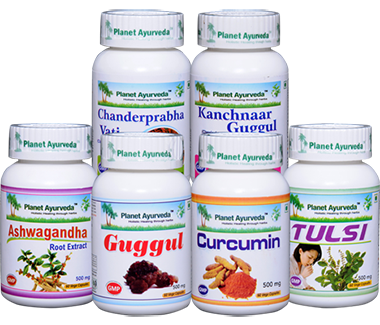 Planet Ayurveda’s herbal supplements are very helpful to relieve health and medical condition in a healthy and natural way. Planet Ayurveda’s herbal supplements are very helpful in fighting various types of cancer. Ayurveda treats the disease according to the specific nature of the patient, the aggravated body energies involved and the body tissues that are affected. Treatment care pack by Planet Ayurveda does not only focus on the area of malignancy but on the entire body system. Treatment includes the administration of blood cleansing herbs along with the changes in the diet. Ashwagandha Capsules are obtained from the herb Withania somnifera. It is a wonderful herb used in the treatment of fatigue, stress and weakness. It has natural rejuvenating properties that helps in maintaining proper nourishment of the tissues. Curcumin is an active compound found in turmeric. The immense benefits of curcumin have been described for thousands of years in Ayurveda. Its capsules are the best herbal remedies for treating various types of cancers and its regular use protects the body from damage caused by the free radicals. Curcumin capsules of Planet Ayurveda contain pure herbal extract of standardised curcumin. The bark of Kanchnaar tree has been found to be useful in the blockages of lymphatic channels, inflammation of lymph nodes etc. The use of this kanchnaar guggul is found to be very effective in all kinds of tumors. Planet Ayurveda's Tulsi capsules contain standardised extract of Tulsi (Ocimum sanctum). The immense benefits of tulsi have been described in Ayurveda since ages. It is considered as a sacred herb. This herb is quite effective in cancer as well as in reducing ill effects of radiotherapy of cancer. Chanderprabha Vati is a classical Ayurvedic formulation useful in the treatment of cancer, tumor and fibroids. It acts as a catalyst for other herbal ingredients to deliver swift therapeutic action. It also acts as anti-aging as well as rejuvenative. Guggul Capsules of Planet Ayurveda are prepared from the standardised extract of best quality guggulu (Commiphora mukul). Guggul capsules help in maintaining healthy muscles and helpful in muscular pain. Guggul possesses anti-inflammatory, anti-oxidant and rejuvenating properties therefore revitalises the cells and rejuvenates them.